The samurai were loyal, honorable and fearsome warriors to behold! The costume comes with a light brown polyester shirt with oversized sleeves and dark brown trimming. The sleeveless tunic is a brick red with Asian characters and beige satin trim along the opening and at the shoulders. The beige sash is satin and ties at the waist. The black polyester pants have a wide leg true to Japanese style. The latex helmet adds realistic touch to the look with a plastic gargoyle piece that velcros onto the front. 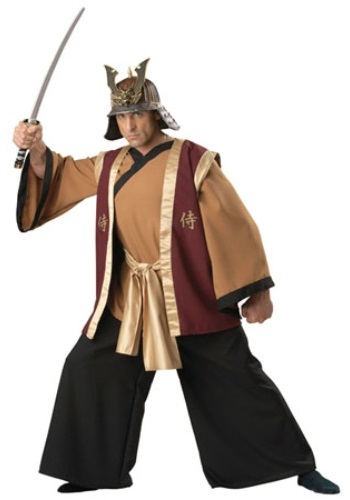 And of course a samurai isn't complete without his sword, so get ready to show your love of Japanese culture and history at your next Halloween or themed event in true Asian style.